The Cold Snap Pole Clamp attaches to your portable ice shack poles, or any 7/8" pole. The Pole Clamp rotates and pivots while holding your rod handle securely, yet allows easy access when fish are near. 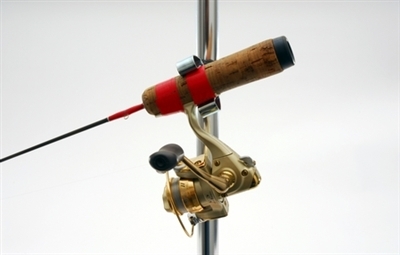 Keep extra poles handy while fishing for a quick presentation change. Will also hold a small portable flash light, or use it to hang for your coat or gloves. Quickly detaches when you're done fishing. Will not harm your rod or portable shack. Easily the most inexpensive and convenient rodholder on the market! Cold Snap Pro Staff tested and Iceaholic approved. Tested tough in the field for the last 9 seasons. 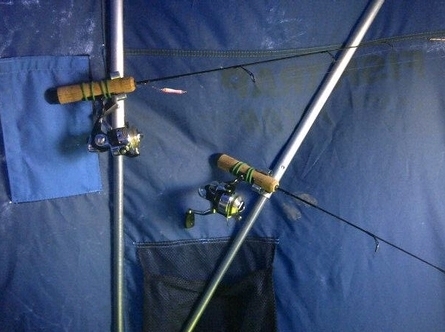 2 Cold Snap Pole Clamps per order. The Large Cold Snap Pole Clamp is suitable for the upper larger poles in your larger Frabill, Otter, and X series Clam portables. The Regular Cold Snap Pole Clamp is suitable for your Eskimo, Otter, Clam, and Frabill support poles. When in doubt these are the size to order. These will also work on the lower poles in Otter and X series Clam shelters.